The European Union gave its report on Monday after delaying over 7 months. This slow movement to publish the report is seen as to lull the dictator Melese Zenawie regime and to have all the elements to its side as the proverbs says «One who laughs last laughs the best”. In the end it fire back on the reporter, Mr. Thijs Berman, a member of the European Parliament and head of Ethiopian election observer mission from Belgium. He recently complained that his team was denied a visa by ‘unhappy’ Ethiopian authorities. The mission was supposed to officially submit its report to Ethiopian Government in Addis Ababa. However, Addis authorities are furious about the report which they have infiltrated to know the content were prouder to humiliate him by denying visa to Ethiopia where he was supposed to declare the report. Melese Zenawie the outrageous dictator of Ethiopia who controls all power in country and heads the Ethiopian People’s Revolutionary Democratic Front (EPRDF), rugged and won 99.6 per cent in May this year election. He thought he got the European Union observer Mr. Berman under his rug. The final report he succeeded to drag it over 7 months in contradiction to 5 years earlier election EU Reporter Mrs. Ana Gonzales in 2005 did not fall under the charm of Zenawie. Mr. Thijs Berman did not hit the Iron when it is hot as his collage Gonzales. You never make complicity with a murderous dictator like Zenawie. The Reporter would have made his report like everybody else 7 month ago. Any way late is better than never. 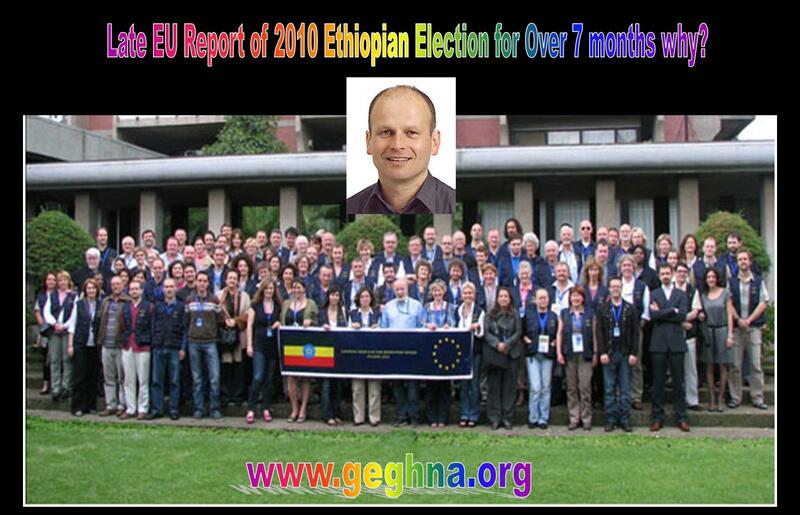 The long waited compromised report of the EU declared that the Ethiopia’s national elections in May were flawed. It says the electoral process was short of international standards concerning transparency, and that state resources were used in the ruling party’s campaign. The late report further affirmed that Opposition candidates also feared the consequences of their political activities. It is the Human Rights Watch on Monday who gave the courage to Mr. Thijs Berman that the long held report to come out and declare that the Ethiopia has systematically clamped down on its citizens’ right to cast ballots freely, and the government’s overwhelming victory shows how little Ethiopia allows dissent. The whole world has seen the electoral game that the Ethiopian electoral field was balanced in favor of Prime Minister Meles Zenawi and allied parties won all but two of the 547 seats in parliament, but this out right truth took Mr. Berman to declare over 7 months. Mr. Berman after reading the Human right watch report recognized that the local administrations that are almost entirely controlled by the Ethiopian Peoples’ Revolutionary Democratic Front should in future have a reduced role in elections to make the process fairer if Melese did not control more than 99 percent of local administrations in the country. Mr. Berman presented his report in Brussels after observers failed to get permission to deliver the report in Addis Ababa, said Thijs Berman, a Dutch member of the European Parliament who led a team to the Horn of Africa country in May. He declared that he had “no idea” why the report wasn’t presented in Ethiopia. The EU reporter saw in front of their eyes that the dictatorial regime’s ruling party alliance won all but four of the 1,904 seats for the regional state councils in this year’s elections. 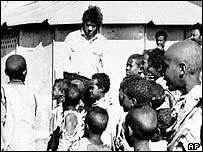 Melese Zenawie the genocidal dictator of Ethiopia came to power in 1991 baying arms with the money collected by Band Aid in mid 80’s. 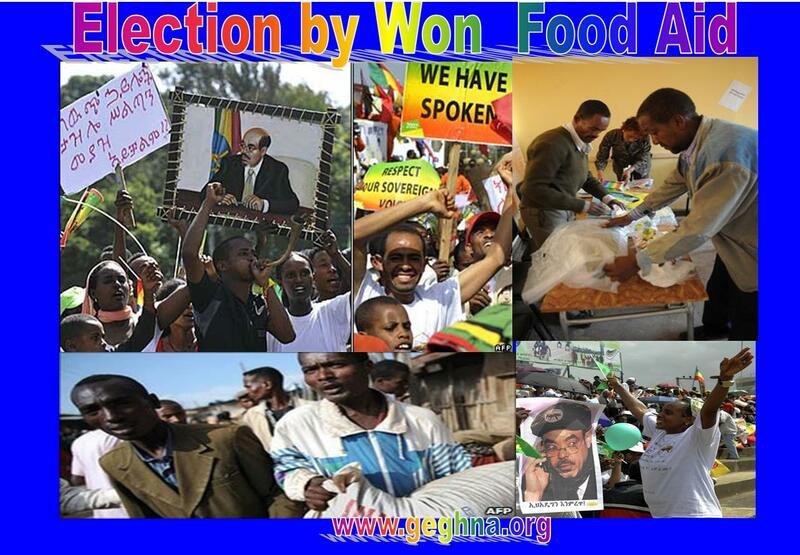 In 2010 he used famine aid money to intimidate the voters to maintain his power for life. Read here under how Band Aid tried to justify how he makes million on the back of million Ethiopian Dry Bones making discs. Bob Guldof and his group must face international investigation on his complicity with African dictator to suppress the famines. 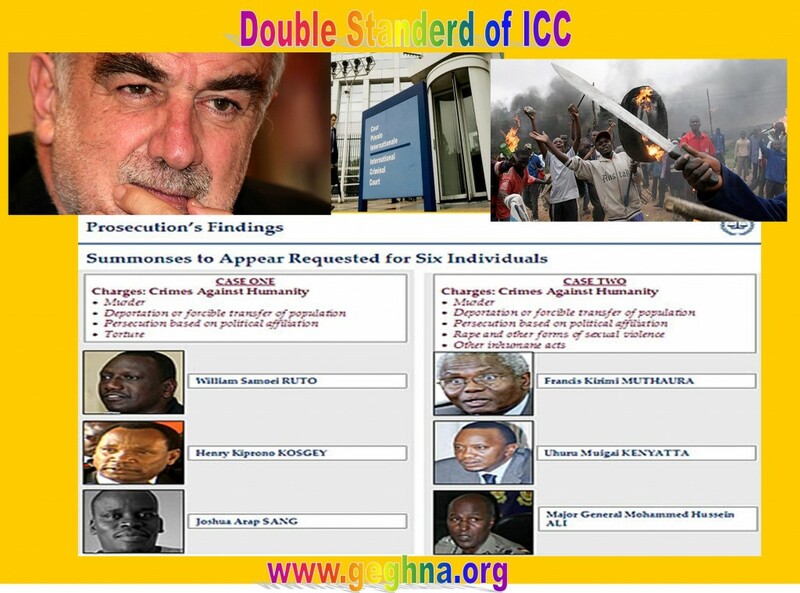 Surely he will face the international court of justice with his complicit Melese Zenawie. Since a criminal comes back on his crime scene, Melse and Bob Guldof continue cheating the whole world. One keeps his powers the other continuing his so called “Band Aid “to perpetuate the starving millions in misery. His disc was in bankrupt in mid 80′ when band Aid ingeniously saved him rather than the dying millions supposedly helped. (London) – The Ethiopian government is using development aid to suppress political dissent by conditioning access to essential government programs on support for the ruling party, Human Rights Watch said in a report released today. Human Rights Watch urged foreign donors to ensure that their aid is used in an accountable and transparent manner and does not support political repression. The 105-page report, “Development without Freedom: How Aid Underwrites Repression in Ethiopia,” documents the ways in which the Ethiopian government uses donor-supported resources and aid as a tool to consolidate the power of the ruling Ethiopian People’s Revolutionary Democratic Front (EPRDF). Ethiopia is one of the world’s largest recipients of development aid, more than US$3 billion in 2008 alone. The World Bank and donor nations provide direct support to district governments in Ethiopia for basic services such as health, education, agriculture, and water, and support a “food-for-work” program for some of the country’s poorest people. The European Union, the United States, the United Kingdom, and Germany are the largest bilateral donors. Local officials routinely deny government support to opposition supporters and civil society activists, including rural residents in desperate need of food aid. Foreign aid-funded “capacity-building” programs to improve skills that would aid the country’s development are used by the government to indoctrinate school children in party ideology, intimidate teachers, and purge the civil service of people with independent political views. Political repression was particularly pronounced during the period leading up to parliamentary elections in May 2010, in which the ruling party won 99.6 percent of the seats. Despite government restrictions that make independent research difficult, Human Rights Watch interviewed more than 200 people in 53 villages across three regions of the country during a six-month investigation in 2009. The problems Human Rights Watch found were widespread: residents reported discrimination in many locations. Human Rights Watch also documented how high school students, teachers, and civil servants were forced to attend indoctrination sessions on ruling party ideology as part of the capacity-building program funded by foreign governments. Attendees at training sessions reported that they were intimidated and threatened if they did not join the ruling party. Superiors told teachers that ruling party membership was a condition for promotion and training opportunities. Education, especially schools and teacher training, is also heavily supported by donor funds. In 2005, the World Bank and other donors suspended direct budget support to the Ethiopian government following a post-election crackdown on demonstrators that left 200 people dead, 30,000 detained, and dozens of opposition leaders in jail. At the time, donors expressed fears of “political capture” of donor funds by the ruling party. Yet aid was soon resumed under a new program, “Protection of Basic Services,” that channeled money directly to district governments. These district governments, like the federal administration, are under ruling party control, yet are harder to monitor and more directly involved in day-to-day repression of the population. During this period the Ethiopian government has steadily closed political space, harassed independent journalists and civil society activists into silence or exile, and violated the rights to freedom of association and expression. A new law on civil society activity, passed in 2009, bars nongovernmental organizations from working on issues related to human rights, good governance, and conflict resolution if they receive more than 10 percent of their funding from foreign sources. As Ethiopia’s human rights situation has worsened, donors have ramped up assistance. Between 2004 and 2008, international development aid to Ethiopia doubled. According to Ethiopian government data, the country is making strong progress on reducing poverty, and donors are pleased to support Ethiopia’s progress toward the United Nations Millennium Development Goals. Yet the price of that progress has been high. When Human Rights Watch presented its findings to donor officials, many privately acknowledged the worsening human rights situation and the ruling party’s growing authoritarian rule. Donor officials from a dozen Western government agencies told Human Rights Watch that they were aware of allegations that donor-supported programs were being used for political repression, but they had no way of knowing the extent of such abuse. In Ethiopia, most monitoring of donor programs is a joint effort alongside Ethiopian government officials. Yet few donors have been willing to raise their concerns publicly over the possible misuse of their taxpayers’ funds. In a desk study and an official response to Human Rights Watch, the donor consortium Development Assistance Group stated that their monitoring mechanisms showed that their programs were working well and that aid was not being “distorted.” But no donors have carried out credible, independent investigations into the problem. Human Rights Watch called on donor country legislatures and audit institutions to examine development aid to Ethiopia to ensure that it is not supporting political repression. Led by the Tigray People’s Liberation Front (TPLF), the ruling party is a coalition of ethnic-based groups that came to power in 1991 after ousting the military government of Mengistu Haile Mariam. The government passed a new constitution in 1994 that incorporated fundamental human rights standards, but in practice many of these freedoms have been increasingly restricted during its 19 years in power. Although the ruling party introduced multiparty elections soon after it came to power in 1991, opposition political parties have faced serious obstruction to their efforts to establish offices, organize, and campaign in national and local elections. Eight-five percent of Ethiopia’s population live in rural areas and, each year, 10 to 20 percent rely on international food relief to survive. Foreign development assistance to Ethiopia has steadily increased since the 1990s, with a temporary plateau during the two-year border war with Eritrea (1998-2000). Ethiopia is now the largest recipient of World Bank funds and foreign aid in Africa. In 2008, total aid was US$3.3 billion. Of that, the United States contributes around $800 million, much of it in humanitarian and food aid; the European Union contributes $400 million; and the United Kingdom provides $300 million. Ethiopia is widely considered to be making good progress toward some of the UN Millennium Development Goals on reducing poverty, but much of the data originates with the government and is not independently verified. Ethiopia’s government has been withholding foreign aid from opposition supporters, Human Rights Watch says. Its report urged donors to ensure their aid was distributed transparently. Ethiopia is one of the world’s largest recipient of development aid – in 2008 international donations to the country totalled $3bn (£1.8bn). Its government has not yet commented on the report but has rejected similar accusations in the past as “ridiculous and outrageous”. BBC East Africa correspondent Will Ross says this leaves donors in a dilemma because they are reluctant to turn off the taps as they feel this would reverse the gains. In May, Ethiopia’s governing party trounced the opposition in elections – only one opposition MP was elected in the 536-seat parliament. In contrast, the opposition won more than 170 seats and swept the board in the capital, Addis Ababa in the previous election, in 2005. However, they said they had been cheated of victory and organised street protests. Nearly 200 opposition supporters and several policemen were killed and a comprehensive crackdown on the opposition followed, with politicians and supporters jailed. Many analysts suggest the muzzling of the opposition was a major factor behind the governing party’s sweep to victory in May. Our correspondent says the government has worked hard to deliver services to the population. But Human Rights Watch accuses the donors of focusing only on the development and ignoring the repression as they continue to pour money into the country. “If independent NGOs were allowed to work, civil society was allowed to play its role and international NGOs were allowed to distribute directly to Ethiopian citizens then you would cut out the pernicious role that the state is playing,” Mr Rawlence said. He said that Ethiopia now was one of the most repressive societies in the world. “People were very, very scared about talking to me – they would only do so in safe-houses,” he said. A new version of the Band Aid song Do They Know It’s Christmas? and a DVD of the Live Aid concert are expected to be big sellers in the festive season. Where is the money going? No. The bottom line is at least £2.43 from each £3.99 CD single is going to charity, but it may rise to £3.53. Record company Mercury and the Band Aid Trust say £1.83 goes straight to charity. Another 60p will be paid in VAT then refunded to the Trust by the government. Record shops would normally keep a £1.10 slice. But most big chains – including HMV, Virgin Megastores, Woolworths, Tesco, WH Smith and Sainsbury’s – have agreed to give their profits to charity. But it is not as simple as giving £1.10 back per CD. Shops have bought huge quantities from Mercury and need to sell enough to cover those costs before breaking even. Only then would any profit go to charity – so the more copies sold, the more likelihood there is of shops making a profit, and the higher that amount is likely to be. The other 46p in the £3.99 covers the record company’s essential costs – such as manufacturing, labels and distribution, which are all done by the company itself. Mercury is not making any profit from the CD. But lots of people who would normally be paid have given their time and effort for free – from the singers and musicians themselves to PR people, artwork designers, shops that have done marketing activities and TV stations and magazines who have donated advertising space. What about internet downloads and mobile phone ringtones? The new version of Do They Know It’s Christmas? is being sold for £1.49 to download, or for £1.99 they will throw in the original 1984 version too. But unlike CD singles, there is no manufacture and delivery process so almost every penny goes to charity. The same goes for ringtones, with telephone companies giving most proceeds to charity. How much will be raised for charity? If a million copies of the CD are sold, the total proceeds going to charity, including funds from downloads and ringtones, could be about £3m – depending on where they were bought. What about the Live Aid DVD? As with the single, the full price you pay does not go to charity – but it is impossible to say exactly how much does. 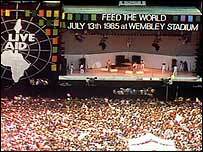 Warner Vision International won a bidding war for the rights to release the 1985 concert for the first time, paying an unspecified but “huge” sum in the millions, they say, to the Band Aid Trust. On top of that, they are paying an “above-standard royalty rate” that will go up as sales increase. Record shops and other retailers are taking some of their cut. They pay up to £27 per four-disc set and would normally keep the difference between that and the price fans pay. But shops are believed to be making an unspecified “fixed contribution” to charity for each DVD sold. Internet retailers are the cheapest, selling the DVD for £27.99, with prices elsewhere rising to the recommended retail price of £39.99. What will the charity money be used for? The Band Aid Trust has been going since the original single was released, handing out $144m (£75m) to famine relief projects across Africa between January 1985 and November 2004. Of the latest money raised, a Band Aid statement said: “These funds are distributed to various organisations that implement sustainable projects aimed at relieving poverty and hunger in Ethiopia and the surrounding area via a funding process. “This involves inviting organisations to submit proposals to the trustees for consideration – those projects that meet the Trust’s objectives and the approval of the trustees are funded. The Double sided dictator of Ethiopia Melese Zenawie lost his credilbity if left any in the eyes the world democrats. He thought he mastered the arts of duping the whole world, but it was he who was dumped and lost face all around the world. -He prepared farse 40’000 ballots, only very fews samples were oberved by African and Europen observores. -He blocked the US and the rest of the embasies not to live the capital so he could be free to manuplate. -He killed and beated the oppostion members. -He recruted each and every one in the counry side to be the member of his party if not just to vote only for EPRDF. -He closed private press and throw the journalist to jail..
-He silenced the univeristy students by intimidating and occupying the university illegally by his security forces… etc, etc.. It is the organization of the African Banana Union which is his making , who recognized his election as being fair and free, since his ballot rugging was better than theirs, and his style of mastering the arts of silencing the opposition , his mechanism of completely killing the voice of the people, his way of brutalizing and starving the population of Ethiopia to death, is a new style of african democray in order to become a leader for live. Results show Prime Minister Meles Zenawi’s ruling Ethiopian People Revolutionary Democratic Front (EPRDF) was the clear winner in Ethiopia’s parliamentary elections last month, despite accusations of fraud and the misuse of state funds, according to BBC News. Ethiopia’s Communications Minister Bereket Simon called the elections “free and fair,” but international observers from the EU and the United States said the contest fell well short of international standards. EPDRF party members dismissed the allegations as an attempt to undermine the party’s rule. “We know the opposition had designed a strategy whereby they tried to tarnish the whole democratic electoral process. The facts on the ground tell everybody that this has been a competitive election…the system accommodated even extra requests by the opposition. 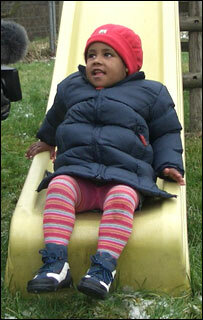 So, one can say we have issued [a] free and fair playing ground,” said Communications Minister Bereket Simon. Though this year’s elections were free from the political violence of previous contests, observers point out that the relative peace was more the result of careful planning by the EPDRF than of democratic progress. In 2005, a dispute over election results led to the death of 193 opposition protestors at the hands of Zenawi’s forces. This time around, the Prime Minister “closed down a number of critical newspapers, jammed Voice of America, blocked critical websites, banned all forms opposition rallies, crippled civil society organizations, and deliberately fomented divisions in the opposition camp,” according to the Wall Street Journal. Over the last 18 months, the “government has taken clear and decisive steps that would ensure that it would garner an electoral victory,” said US Assistant Secretary of State for African Affairs Johnnie Carson. Despite the criticism, Ethiopia is likely to remain an important US ally in the fight against Islamic extremism. According to Nathaniel Myers of Foreign Policy, Ethiopia receives more foreign US aid than any country in sub-Saharan Africa and is an important source of stability in the region. “Wary of alienating Meles, the Obama administration has publicly criticized only the Ethiopian leader’s most blatant assaults on democracy. And indeed, with the failure to permanently reduce aid budgets following the 2005 violence, the West lost its trump card. At the end of the day, Meles knows that the United States and his other foreign friends can’t afford to back out,” said Myers. Invigorated by the belief that the time had come in the year 2000 to establish a global network of democratic countries with the principal aim of fortifying democratic governance everywhere, former Secretary of State Madeleine Albright and former Polish Minister of Foreign Affairs Bronisław Geremek convened the first Ministerial of the Community of Democracies (CD) in Warsaw. With delegates representing 106 democratic and democratizing countries in attendance, the Community of Democracies was established with the adoption of the Warsaw Declaration, committing CD governments to a multilateral framework of cooperation to advance democratic norms and to work in concert to support and deepen democracy worldwide. “Addis Ababa, May 25, 2010 Ethiopian People?s Revolutionary Democratic Party (EPRDF) is leading the 4th national elections by winning 499 of the 547 federal parliamentary seats, the National Electoral Board of Ethiopia (NEBE) Chairperson announced here late on Tuesday. In a news conference he gave here today, the Chairperson, Prof. Merga Bekana said partner parties on their part won 35 seats, according to provisional results reaching the Board. He said EPRDF won the election with a majority vote winning 499 seats. According to Prof. Merga, EPRDF won 38 seats in Tigray, 137 in Amhara, 178 in Oromia, 122 in South Ethiopia Peoples State and 22 seats in Addis Ababa. EPRDF partner parties on their part won 8 seats in Afar states, 2 seats in Benishangul Gumuz, 2 seats in Gambella State while winning 21 seats in Somali State, according to the provisional election results reaching the board. He said EPRDF won one seat in each of Harari state and Dire Dawa City Administration while its partners won the rest. Prof. Merga said Forum had won only one seat in Addis Ababa while a private contender won one seat in South Ethiopia Peoples State. He indicated that the Board has not received the result of 1 constituency from Amhara, 7 constituencies from Bensihangul Gumuz, 1 constituency from Gambella and 2 constituencies from Somali states. Prof. Merga thanked the public at large, election contending political parties, religious leaders, governmental and non-governmental organizations for helping make the 4th national elections successful, free, peaceful, fair and credible.”??? Ethiopia’s opposition leaders have called for a rerun of Sunday’s elections, saying they were flawed. Head of the main opposition coalition Merera Gudina said he will not accept the results, which gave Prime Minister Meles Zenawi a landslide victory. The EU and US have both criticised the polls, saying they fell short of international standards. Ethiopian officials have denied fraud. Mr Merera, chairman of the Medrek coalition of eight main opposition parties, has called for a new election. Earlier, another opposition leader Hailu Shawel had also called for a rerun of the elections. The opposition has complained that its election observers had been beaten and driven away from polling stations in several regions. Meanwhile, Mr Merera has said two members of his party were shot dead by security forces in the Oromiya region in the south of Ethiopia, Reuters news agency reports. “The government is trying to prevent protests by massively repressing the people,” he said. But a government spokesperson claims one man was shot when he stormed an office where ballots were being counted and the other was killed in self-defence by a policeman, Reuters says. According to the official election results, 499 out of 536 seats declared so far have been awarded to the governing party. Medrek – which had been seen as the main challenger to Mr Zenawi’s party – has only won a single seat. Mr Shawel says the results “don’t look real,” reports the AFP news agency. 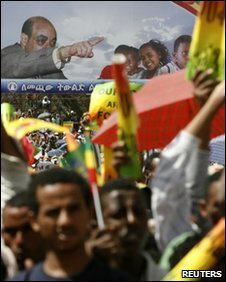 Ethiopia’s last elections, in 2005, were marred by violent protests over alleged fraud which left about 200 people dead. At that time, Mr Shawel was leader of the opposition coalition and was jailed, along with several other opposition leaders, for his role in the protests. Most of those jailed were later pardoned and released, although one opposition leader remains in prison. The BBC’s Will Ross in Ethiopia says opposition leaders risk being sent to prison if they continue their protests, since in the eyes of the Ethiopian authorities, there is a thin line between rejecting the election results and inciting violence. Mr Shawel says he will not call on his supporters to protest, reports AFP. 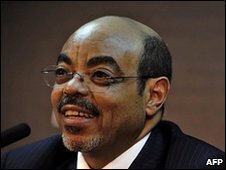 Mr Meles – who has been in power since 1991 – put Sunday’s election win down to an impressive track record, especially when it comes to economic growth. The government has worked hard to improve infrastructure, especially in the urban areas, and social services such as healthcare have become more accessible. Hailu Shawel, who heads the All Ethiopia Unity Party, must realise that his request for a rerun of the election is highly unlikely to be granted. His other option is via the courts. But he knows he must tread carefully as Ethiopia’s government may not tolerate much criticism. In the eyes of the Ethiopian authorities, there is a thin line between rejecting the result and inciting violence and so the opposition party leader risks a return to jail. DDIS ABABA, May 25 (Xinhua) — The Ethiopian ruling party has gained 499 seats in the 547-member parliament, media reported on Tuesday. The report quoted the Ethiopian National Electoral Board as saying the outcome emerged when 536 results were announced. Earlier on Tuesday, the National Electoral Board has announced that the ruling party, the Ethiopian People’s Revolutionary Democratic Front (EPRDF), is leading the fourth national elections by winning 477 of the 547 federal parliamentary seats. Public Relations Head with the Board, Mohammed Abdurahman, said in a statement on Tuesday that the EPRDF won 38 seats in Tigray, 137 in Amhara, 160 in Oromia and eight seats in Afar states, according to the provisional election results. Hundreds of thousands of members and supporters of the EPRDF on Tuesday celebrated party’s victory after announcement of provisional election results by the National Electoral Board. Meles Zenawi, Ethiopia’s current Prime Minister and Chairperson of EPRDF, accompanied by senior government officials, joined the huge crowd at Maskal Square, the grand one in Addis Ababa, capital of the nation. (Nairobi) – Ethiopian government and ruling party officials intimidated voters and unlawfully restricted the media ahead of the May 23, 2010 parliamentary elections, Human Rights Watch said today. 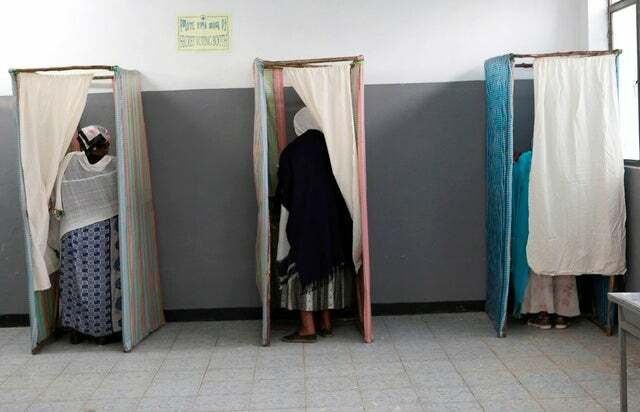 In assessing the polls, international election observers should address the repressive legal and administrative measures that the Ethiopian ruling party used to restrict freedom of expression during the election campaign, Human Rights Watch said. In the weeks leading up to the polls, Human Rights Watch documented new methods used by the ruling Ethiopian People’s Revolutionary Democratic Front (EPRDF) to intimidate voters in the capital, Addis Ababa, apparently because of government concerns of a low electoral turnout. During April and May, officials and militia (known as tataqi in Amharic) from the local administration went house to house telling citizens to register to vote and to vote for the ruling party or face reprisals from local party officials such as bureaucratic harassment or even losing their homes or jobs. The May poll was the first national parliamentary election in Ethiopia since the government violently suppressed post-election protests in 2005; almost 200 people, including several police officers, died after the 2005 poll and tens of thousands of people were arrested, including opposition leaders, journalists and civil society activists. In a March 2010 report, “‘One Hundred Ways of Putting Pressure’: Violations of Freedom of Expression and Association in Ethiopia,” Human Rights Watch described the complex and multi-faceted way in which the government has sought since 2005 to silence dissent, restrict the media and independent civil society, and leverage government resources such as civil service jobs, loans, food assistance and educational opportunities to encourage citizens to join the ruling party or leave the opposition. The government’s efforts to ensure the election outcome continued right up to polling day in Addis Ababa, according to Human Rights Watch’s research in different areas of the capital, including in Merkato, Piazza, Wollo Sefer, Meskel Flower, Aya Ulet, Kera, Gotera, Hayat, Kotebe-CMC and Bole neighborhoods. Residents of Addis Ababa described numerous forms of intimidation in Addis Ababa in recent weeks. Many people told Human Rights Watch that tataqi, local kebele (or neighborhood) militia members came house-to-house asking to see registration cards and checking if people were members of the ruling EPRDF party. A couple living in the Meskel Flower area said they were visited on a weekly basis by members of the neighborhood militia who were checking whether they were registered as EPRDF members. The wife told Human Rights Watch: “One of them approached my husband. ‘We know who you are,’ he told him. ‘If you don’t want to register, no problem, but then don’t come to the sub-kebele and ask for your ID renewal, or for any other legal paper. We won’t help you. It’s up to you, now.” The following day the couple registered. Different sources across the capital confirmed to Human Rights Watch that alongside registration, voters were requested to sign a paper, under a heading “Supporter of EPRDF,” that included ID number, age, and address. Pressure to vote for the EPRDF appeared to take a number of different forms. Pressure was particularly acute among civil servants, people living in government-owned housing, and those living in poor neighborhoods. An elderly resident living in state-owned housing said local government officials visited her house a few weeks before the elections asking to see her registration card. She said they wrote down her house number and told her, “We are going to check. And don’t forget to vote for EPRDF. We provide you the house, we can have it back.” She said that she was frightened by the threat and registered even though she had not intended to vote. Residents also described an EPRDF pyramid recruitment strategy called One-for-Five. A coordinator (ternafi) had to identify five recruits or fellow voters (teternafiwoch) among family members, friends, colleagues or neighbors. Coordinators then tried to compel their five signers to go to the polling stations and vote all together. Simultaneous with the increased pressure on voters, in the weeks before the polls the Ethiopian government of Prime Minister Meles Zenawi acted to restrict electoral scrutiny by independent media and foreign diplomats. The government issued several codes of conduct covering media and diplomatic activity. Initial drafts of the media regulation restricted foreign and local journalists from even speaking to anyone involved in the election process, including voters on election day, in violation of the right to freedom of expression. Several journalists in different countries told Human Rights Watch that when they applied for media visas to cover the elections, they were extensively questioned by Ethiopian embassy diplomats. The government told Embassy staff they needed travel permits for any movement outside of Addis Ababa between May 10 to June 20. Since 2005, Human Rights Watch has documented patterns of serious human rights violations by the Ethiopian government. Members of the security forces and government officials have been implicated in numerous war crimes and crimes against humanity both within Ethiopia and in neighboring Somalia. The pervasive intimidation of voters and restrictions on movement and reporting are serious concerns for the integrity of the electoral process, but represent only one aspect of the Ethiopian ruling party’s long-term effort to consolidate control. The EPRDF’s main instrument for stamping out potential dissent is the local administrative (kebele) structure, which monitors households and can restrict access to important government programs, including seeds and fertilizer, micro-loans and business permits, all depending on support for the local administration and the ruling party. Since 2008 the government has also passed new laws to clamp down on independent civil society and the media. 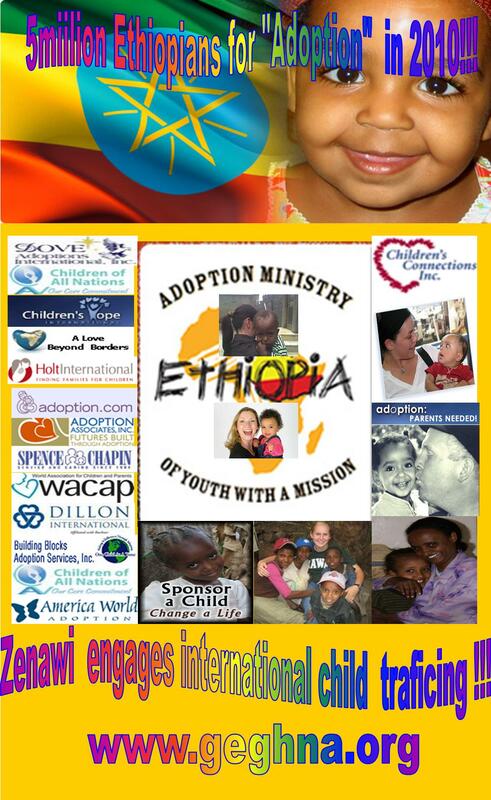 The Charities and Societies Proclamation restricts Ethiopian nongovernmental organizations from doing any human rights work, including in the areas of women’s and children’s rights, if they receive more than 10 percent of their funding from foreign sources. Since the law’s adoption in 2009, the leading Ethiopian human rights groups have closed most of their offices, scaled down their staff, and removed human rights advocacy from their mandates. The new regulatory agency established by the Charities and Societies Proclamation froze the bank accounts of the largest independent human rights group, the Ethiopian Human Rights Council. At least six of Ethiopia’s most prominent human rights activists fled the country in 2009. Another law, the Anti-Terrorism Proclamation, has also been used to threaten with prosecution human rights activists and journalists for any acts deemed to be terrorism under the law’s broad and vague definition of the term. Several journalists also fled in 2009, including the editors of a prominent independent Amharic newspaper, and in February 2010 Prime Minister Meles acknowledged that the government was jamming Voice of America radio broadcasts. Human Rights Watch urged the international election observer teams from the European Union and the African Union to take into account in their public reporting the insidious apparatus of control and the months of repression that frame the 2010 polls. Ethiopia is heavily dependent on foreign assistance, which accounts for approximately one-third of government spending. The country’s principal foreign donors – the United States, the United Kingdom, and the European Union, which provide more than US$2 billion annually in humanitarian and development aid, – were timid in their criticisms of Ethiopia’s deteriorating human rights situation ahead of the election. Human Rights Watch called on the principle donors and other concerned governments to publicly condemn political repression in Ethiopia and to review policy towards Ethiopia in light of its deteriorating human rights record.